Here we are a few days ahead of this year’s event. 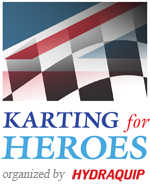 I am pleased to be able to say we have a very nice grid of 31 teams, so far, which will help make sure we are able to raise a significant amount of money for Help for Heroes. As always we have some great items in our Auction which have been generously donated by our supporters meaning 100% of what is bid on the day will go to H4H. K4H is a team event on track but everyone is welcome to come along on the day to support us by watching the event or even hanging around for the auction after the race which is open to all. If you not entered this year and are at a loose end on Saturday 6th May please drop by to Buckmore Park and have a look at the event and perhaps pencil it in for 2018. If you have any questions of comments please get in touch.